In playing around with the beads that I received from Jesse James Beads, I figured out another fun motif that you can stitch to enhance your bead embroidery. The motif is stitched with a combination of peyote and herringbone stitches, and then is stitched down to a foundation fabric. 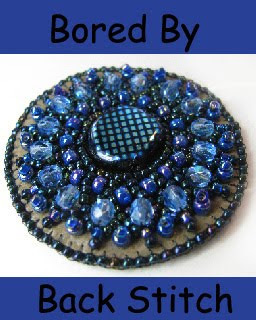 In my e-book Bored By Back Stitch, I teach you how to create twelve different bead embroidery motifs, using nine different beadweaving stitches, so maybe you can think of this one as the baker's dozen supplement! 1. 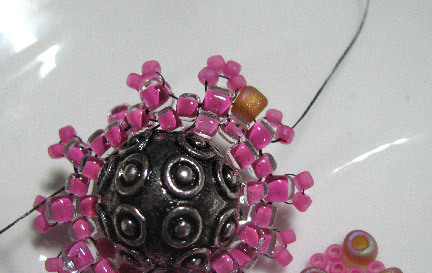 Stitch back and forth through the focal bead to add two size 8/0 beads at each end. Add both at the same time. Leave about a 6" tail. 2. 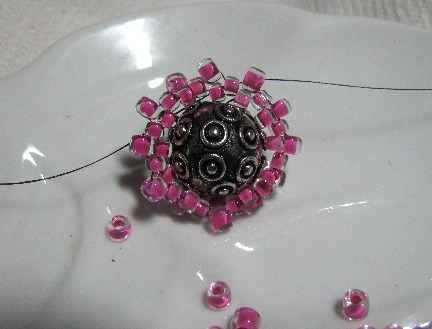 String 10 size 8/0 beads on each side to give you 24 beads altogether. 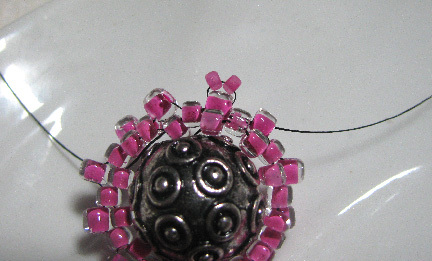 Run the thread through all the beads a second time to tighten. You can use a different number of beads if you want, as long as there are the same number on each side. But if you want a clock pattern, there must be 24 beads to start. 3. 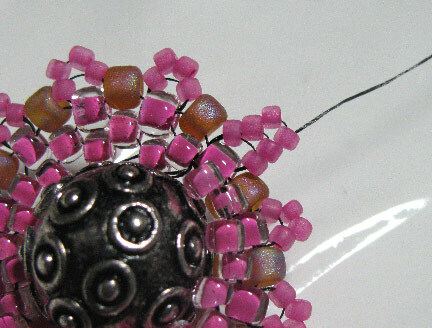 Using peyote stitch, add size 6/0 beads in the same color around the ring and step up at the end. You will have 12 size 6/0 beads in this row. 4. Create the herringbone base in this row by adding two size 11/0 beads on each 6/0 from the last row. Stitch down through the next 8/0 from the first row and up through the next 6/0 to add the next stitch. Repeat around, and step up through the first two size 11/0s added. 5. For the second herringbone row, add two more size 11/0s and stitch back through the pink size 6/0. Add a root beer colored 6/0 between each stitch, stitch through the next pink size 6/0, and repeat adding herringbone stitches and more size 6/0s around. Step up through the first herringbone stitch added this row. 6. Add a third herringbone stitch. Stitch down through the herringbone stack, through the pink size 6/0 beneath them, and back up through the other side of the herringbone stack to exit back at the top. 7. 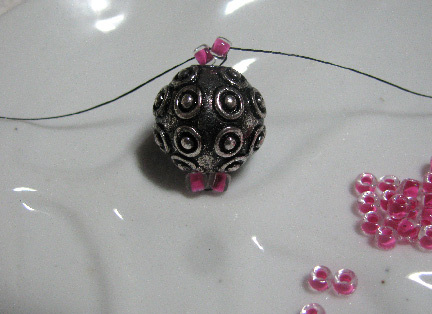 Add a cube bead and a single size 11/0 as a stopper bead. Stitch back down the left side of the herringbone stack, through three size 6/0s, and up through the right side of the next stack to repeat around. 8. 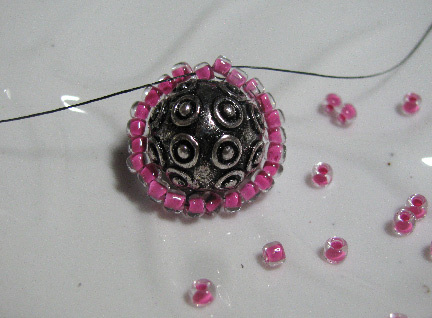 Cut a small hole in a piece of foundation fabric to allow your focal bead to sink into it slightly. Use the active weaving thread and the tail to stitch the piece down. 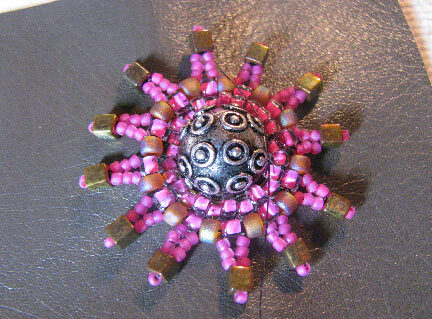 I started by stitching each brown size 6/0 down, and then moved out to the stopper beads and stitched them down. End your threads on the back. I'm hoping to have this finished by next week (Part two)so that I can show you some additional embellishment ideas and show you how to finish the piece off as a pendant. Till then! This post contains affiliate links: Jesse James Beads and Beadaholique. 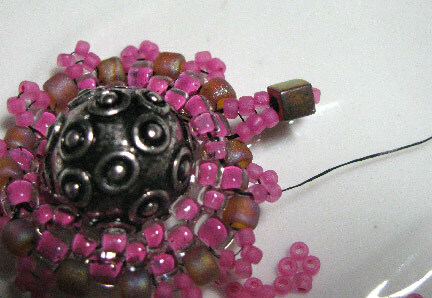 I received the beads from Jesse James Beads free of charge in order to create several projects at no cost for you. This is really cool I could have used this design for my Steampunk quilt...but it's finished now and I'm not adding anymore to it.